North Lake Leelanau (approximately 20 minutes northwest of Traverse City, Michigan). 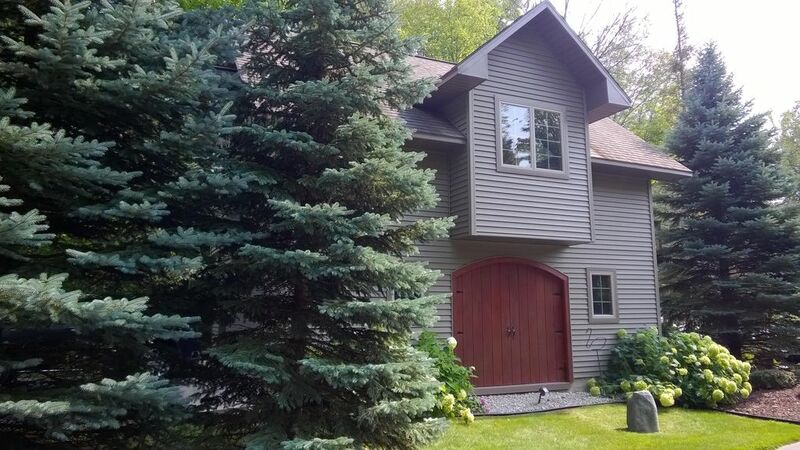 Newer upper level carriage house is accessed via private road, in a park-like setting and is within 50’ of hard, sandy bottom North Lake Leelanau. Be our guest on our lake front lot (over 100’). We are hosts who make sure your stay is very enjoyable. Has an open floor plan that is beautifully decorated, with fully equipped kitchen, full bathroom, living room, and full size brand-new very comfortable Murphy bed, air conditioning, and immaculately clean. Bed linens and towels are provided. Perfect accommodations for two people. Great romantic getaway or honeymoon cottage. So many great restaurants, wineries, coffee shops, brewery (Hop Lot), hiking/walking, biking, sight seeing, fishing charters, and casino. Everything is here! Rental during July and August is weekly from Saturday to Saturday. Arrival 4:00 p.m. with departure at 10:00 am the following Saturday. From Traverse City go north on M-22 to Suttons Bay. Shortly after going thru Suttons Bay, turn left (west) onto M-204 -- proceed (approx 5 miles) to the corner of Eagle Highway also known as North Lake Leelanau Drive/641. Turn right on Eagle Highway (also known as North Lake Leelanau Drive / 641). In 1/2 mile, turn left (this is still N. Lake Leelanau Drive / 641). Continue 1/2 mile (halfway up hill) to first road (dirt) and turn left, there are posts with names listed. It is marked N. Sunset Shores and N. Twin Pines Drive. Drive down dirt road until you see a curve to the left, turn left at curve. Proceed to 9th driveway on right to 487 N. Twin Pines Drive. Had vacationed in this beautiful area (Leelanau County) for years and love it (still do). One of the most beautiful areas in the world, especially Sleeping Bear Dunes as it was voted most beautiful in the world by Good Morning America. Perfect for two - vacation or honeymoon. Close to Villages of: Lake Leelanau, Leland, and Suttons Bay, Northport, and Glen Arbor. Beautiful views from the dock. State of the art mini-split system for A/C and heating. Brand new mini-split system for A/C and heating. Heats and cools in minutes. Can use washer in main house. Can use dryer in main house. Garage below carriage house is for your use. Snack bar with 4 stools. 4 Bar stools at kitchen bar and coffee table pulls out to use as a snack/eating area. Beautiful pool table and also dart game. Sunsetter awning w/remote. Private with table, 4 chairs, and 2 lounge chairs. Two sit-on top kayaks provided. Gas grill on the bottom deck. Air Conditioning, Beautiful Pool Table, Electronic Dart Game, Deck w/automatic Sunset awning if needed, beach towels and chairs, lawn fire pit, life jackets. Jessie is a joy to work with! Thank you and please do come again. Carriage house in the woods near the lake. Everything was perfect. Thanks for the kind words. Please do return again and for a longer stay. You left the carriage house in tip top shape. We absolutely loved this place. Larry and Jesse were wonderful hosts who have thought of everything in this rental. It is perfectly located and easy to get to all the places you will want to see. We have stayed in many rentals and this one ranked right up there. Thank you for the kind words and review. Definitely looking forward to a return visit from you. Have a great rest of the Fall and Winter. Hoping you get to return. Should we go to VA, will sure look/call you. Fall is now starting in our area. Everything you need for a getaway! The hosts were wonderful and the space well stocked and spacious. ]will have a little more time to get to know you both better. Busy time of year with all the local festivals going on. Central Air and Heating, Wildlife viewing, Sleeping Bear Dunes National Lakeshore, Historic 19th Century Fishtown in Leland, Many Wineries, Charter boat fishing out of Leland, Casinos, Traverse City Film Festival, Ferry to Manitou Islands and Mackinaw Island, Beach Walking, Morel Mushrooming, Great Federal and State Parks, Cherry Festival and always lots to do or not to do (smile). Please contact me directly (231 715-6407) as I accept personal checks (preferably).